October’s Patient of the month is a rather dashing fellow by the name of Brady O’Flynn. Brady has been coming to Oak Animal Hospital since 2009, and we just love him! He recently came to us because he was limping on his right hind leg, unable to put much weight down on it at all. After taking some radiographs, our own Dr. Kang determined that Brady had ruptured his cruciate ligament and would need a surgery to repair it. As Brady’s owner’s had signed him up for Petsecure Pet Insurance long ago, they were able to get pre approval for coverage for the surgery. We then contacted our orthopedic surgeon, Dr. Jandi to schedule Brady’s tibial plateau leveling osteotomy surgery (TPLO), to repair his cruciate ligament. While preparing Brady for his surgery, it was discovered that he had a mass in his tongue. Biopsies were taken, and his TPLO surgery was post poned until results came back. These results returned quickly and let us know that the mass was likely just inflammation caused by the poor boy biting his tongue. Brady’s cruciate repair was rescheduled and completed just a few days later. Brady is currently recovering from his surgery with his supportive and wonderful family. He is currently getting around by way of a special sling that his mom picked out and fitted for him. 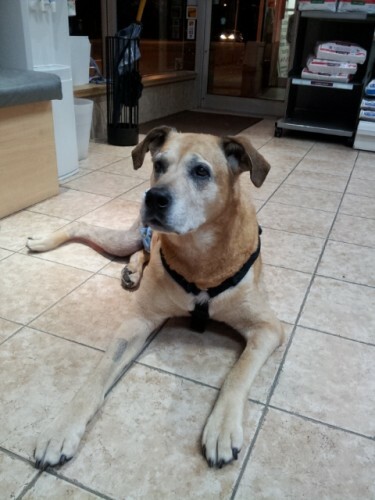 He is also scheduled to begin hydrotherapy to aid in his recovery once his surgery site has healed up.